The King Fire was ignited on 9/13/14 in the Eldorado National Forest northeast of Pollock Pines, CA, where pine plantations lie between steep canyons. Eventhough fuel conditions were dry, environmental winds recorded at nearby weather stations were weak, thus rapid fire growth was not expected. On the 17th, the north-spreading fire reached the Rubicon canyon and ran approximately 15 miles upcanyon to the northeast in one day. 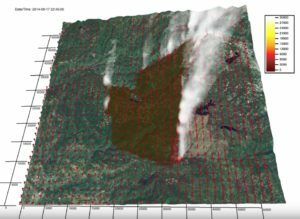 This CAWFE™ simulation spans the evening of 9/16/14, during which the fire is ignited already in progress with the fire extent mapped by the 9:47 PM National Infrared Operations airborne imagery, until this growth period ends the morning of 9/18/14. 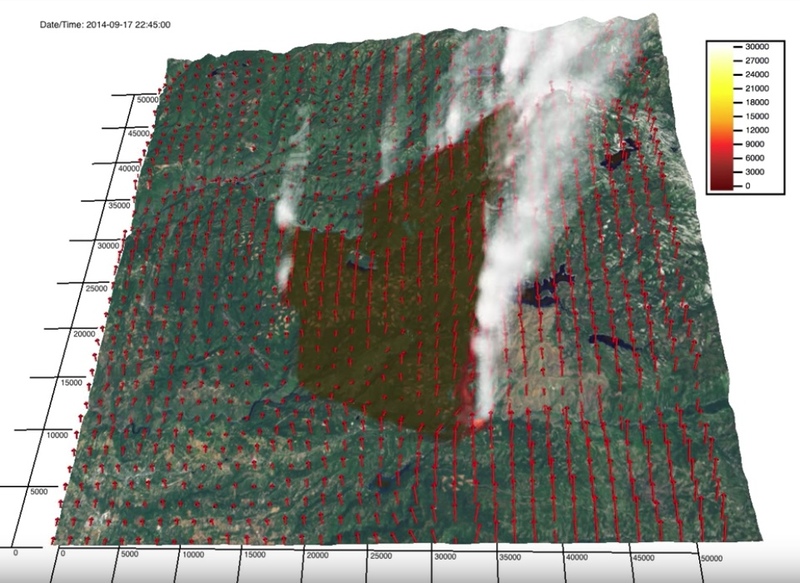 The simulation captures the rapid growth, in which fire-induced winds draw the fire upcanyon, ceasing growth at Hell Hole Reservoir, the water body at the northeast end of the fire. Dr. Janice Coen is a Project Scientist at the National Center for Atmospheric Research in Boulder, Colorado. She studies wildland fire behavior and its interaction with weather using coupled weather-fire computer simulation models and by analyzing infrared imagery of wildfires and prescribed fires.